One capitol hill spot allows you to escape your everyday grind and feel a little more shagadelic, for an hour at least. 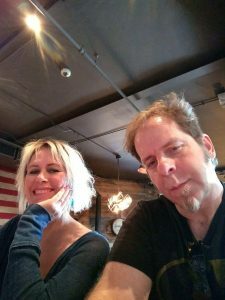 Sharon Simon and her partner, Randy Kopf, are the bubbly team behind the next neighborhood staple, London Alley Salon, near the corner of East 13th Ave. and Marion St. The hole-in-the-wall, British takeover-themed salon opened its doors in April 2017 to provide services for hair styling, waxing, spa treatments and more. “Our small shop is very community- and family- based. We all love each other deeply and treat each other with respect. Clients all feel at home when they walk in. People come in just to say ‘hi’ and have a beer or just hang, outside of doing their hair.” Simon said. Simon was born in Colorado and raised in Maryland. She moved back west once she was older and working as a nurse assistant. After her kids grew up she started to feel like she wasn’t doing what she truly wanted to do and decided to go to cosmetology school. Years later, she was walking down 13th Ave. on her way to the Denver Woman’s March of 2016 and noticed the “for rent” sign in the window of the small shop. She immediately felt a connection to the location. “I really love the vibe of people supporting local businesses and getting out there. From starving college students to wealthy professionals, diversity is what makes it. It’s like everyone is one and the same but so different- either gay, wealthy, straight, middle, young, old and everyone in between.” Simon said. Just as the shop was opening, Simon was in an accident, leaving her with extreme injuries—which led her partner Kopf to step in and get the salon up and running. For five months, Kopf worked his regular job in Colorado Springs and then would come to Denver to do all the renovations and organizing. There are other struggles Simon and Kopf had to face being small business owners, such as negotiating a fair rent without having prices skyrocket on them; but they remain positive about the future. A key element in this positive outlook is that Simon loves her theme and her team. The shop has glitzy and bright 60’s British takeover décor. From the walls draped in British flags and posters of mod London icons to the go-go boot wall and classic red phone booth, no spot goes unnoticed. 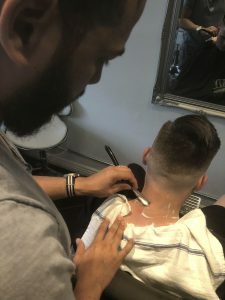 Simon and Kopf’s staff is a small group of three others, including the master barber, Aldo Perez, master stylist, David Garcia, and skin care expert, Erin Capps. Each employee is given the creative space to do what they like, build lasting relationships with clients and set their own schedules. London Alley’s extensive list of services go beyond cuts, colors and styling. There are also options to get specific treatments under the umbrella categories of waxing, extensions, lashes, facials, men’s grooming, and massages. The prices for each treatment are reasonable because Simon says she doesn’t want to take any more than what she needs to reinvest in the shop and staff. All of the products used are either by the Davine brand, Joico, or Ruezel barbery line. The Davine Brand is a pro-environment safety, vegan, and farm-to-product line from Italy which works with nine farms to get separate extracts for each product and keep the farms afloat. 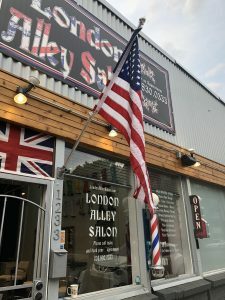 What sets Simon’s craft and the London Alley Salon apart from other shops is the devout love she has for the community and her open door policy. The shop stays open late to work with their range of clients schedules and to host in-shop events such as their karaoke parties. One of the recent parties even had the front man of the B52’s pop by for a few songs. “Randy and I love our clients so much, you know, he just walks outside and meets and talks to everybody, getting their life story. We love karaoke too, so we thought “let’s just do it” one night; and then so many people came in and we were open until 4 am.” Simon said. Outside of the store, Simon likes to focus on her relationships and giving back. Seven years ago, she organized a group of volunteers to cook and bag meals for those who had no food access, and she has continued the effort each year since on Christmas eve. She hopes to get a nonprofit status soon in order to reach out to other nearby business and make more and more brown bag and clothes donations in the upcoming years with their support. During the next few months Simon has planned a Valentine’s-themed Karaoke night on February 8 and London Alley Salon’s two-year anniversary party on April 10. She is most excited to get the neighboring businesses involved and try to host an all-inclusive, LGBTQ, all-body shape and all-age fashion show. To talk more with Sharon Simon or learn more about London Alley Salon bookings and events check out LondonAlleySalon.com.